How to watch Six Nations rugby live? The premier international rugby union tournament concludes with an exciting Week 5 slate. Are you ready to watch Italy vs. France, Wales vs. Ireland, and England vs. Scotland? 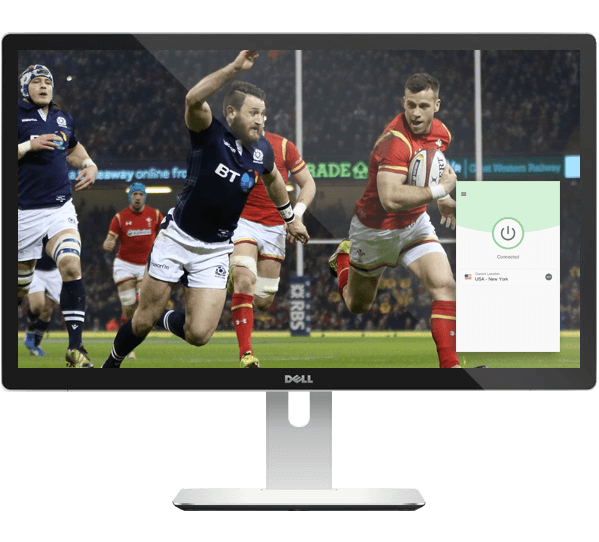 If you don’t want to miss a minute of Six Nations rugby streams, all you need is a VPN and this trusty guide! See all stream options below! For more information and updates, check out the official 6 Nations fixtures list. What are your 2019 Six Nations predictions? The Welsh remain as the only unbeaten team in the tournament. While the title is surely their’s to lose, can they complete a perfect campaign by beating a tough Irish squad? Leave your predictions below and remember to tune in with your VPN! Does express VPN cover New Zealand Rugby Union and All Black matches? You can watch New Zealand Rugby and All Black matches. Simply connect to the location that’s closest to the broadcast provider and you’ll be able to stream with high speeds and anonymity. I’m vacationing in Costa Rica and would like to watch the six nations rugby. If I sign up for VPN will I be able to stream all the games starting with then Ireland Scotland etc? To watch the games, you simply need to know which country is the “home” team for the match. To watch the home games for France, Scotland, and Wales, head to TVPlayer or TVCatchup and select BBC. For the other nations, select ITV. Hi I live in BC Canada and would like to watch the Super Rugby matches played between the teams in Australia, New Zealand and South Africa. Hwo would I be able to use the VPN service to watch these matches either live or delayed. Your advice would be appreciated. Do you offer service in Hungary? Will I be able to see the Rugby word cup also using this service? Does ExpressVPN work with DSTVNow (https://now.dstv.com/) on my Windows 10 Notebook? I am from South Africa and reside in the California but would like to watch my Supersport Channels, etc on DSTVNow. I have a DSTV Account (ie: login). I also need to know if I can use the Chrome or Firefox ExpressVPN Extension to watch on https://now.dstv.com/ instead of the your main APP because I dont want it to interfere with my Amazon Prime Account in the US. In other words, I will be using Firefox with your VPM extension for DSTV and Chrome without your extension for US based accounts like Amazon Prime. Hi I want to watch live rugby games on SuperSport (South Africa), i currently live in SA. Do i have to need a DSTV account to watch local Super sport games? Why do i need an account to stream when i can watch it on the decoder, please advise. I need clarity regarding the account? ExpressVPN helps you watch content no matter where you are and which streaming service you choose to use. It works with DSTV and lets you watch without throttling. I am planning to watch the Rugby League World Cup beginning in the next 2 to 3 days co hosted by Australia/NZ and PNG. I have downloaded the VPN express. With a VPN, you can view Rugby League World Cup streams from a variety of countries. I’m in India and want to watch the rugby. Do i also need subscription to SKY TV? Whats best way for me to get the rugby without having to pay for VPN and subscription to a broadcaster? so I would need pay for SKY TV also? Will I be able to connect to my Virgin Anywhere back home to watch Sky sports? No problem! ExpressVPN does not prevent you from connecting to any web service. In fact, ExpressVPN can help you access your favorite web services from anywhere in the world at high speeds and with added security. Just connect to an ExpressVPN server in a country where the service is available, and you’re all set!